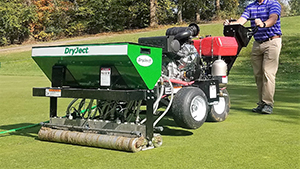 DryJect equipment features the only proven technology of its kind. High pressure water penetrates the turf root zone, and dry amendments including sand/peat mixtures, inorganic soil amendments and more are injected into the aeration holes. Key benefits are speed, labor savings and increased profitability for golf courses. Aerate, amend and back-fill the holes on 18 to 20 greens in one day with time to spare! Greens are playable one hour after completed.